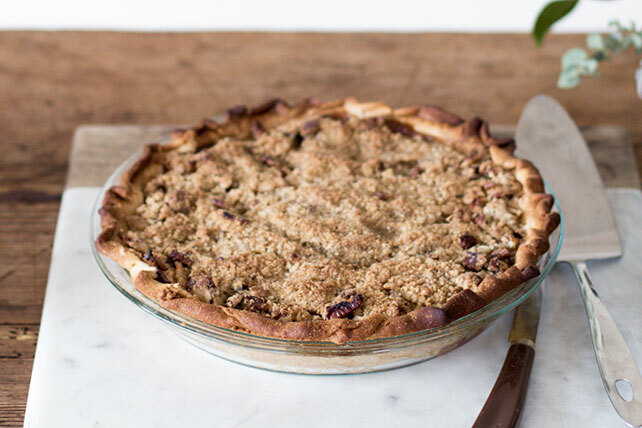 People like any pie that has streusel on top! Still, this one—made with apples and perfectly ripened pears—deserves special mention. Preheat oven to 400°F. Toss apples and pears with 1/2 cup of the brown sugar, tapioca and cinnamon in large bowl. Let stand 15 minutes. Mix flour and remaining 1/4 cup brown sugar in medium bowl. Cut in butter until mixture resembles coarse crumbs. Stir in walnuts; set aside. Prepare pie crust in 9-inch pie plate as directed on package. Fill with fruit mixture; top with crumb mixture. Bake 45 to 50 minutes or until juices form bubbles that burst slowly. Cool.